*Chronologically, I would place these stories between TMNT Adventures #22 and TMNT Adventures #23. 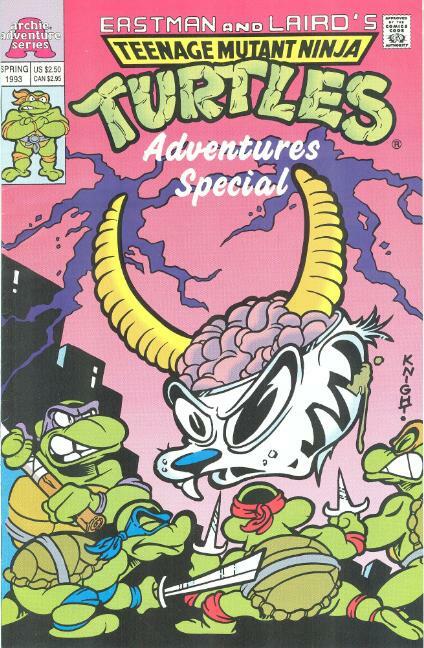 *Due to the presence of Cudley the Cowlick, this story cannot take place between TMNT Adventures #38 and TMNT Adventures #48 and must take place beforehand. Considering the TMNT are chilling in their sewer lair, that forces it to take place before the "world tour" arc that began in TMNT Adventures #28, too. But it has to take place after Mighty Mutanimals (miniseries) #3, again, due to the presence of Cudley the Cowlick. Complicated, I know. GAH! That cover have the same artist as TMNT:Adventires Special #8 also know as THE WORST TURTLES COMIC *I* HAVE EVER READ! Can't wait for you to review IT. Considering his cover came as the first in a series of zany, super-deformed looking turtles drawn by himself, Hedden/McWeeney, and Bill Fingerman... I'd say he fits in quite well with the rest of 'em.